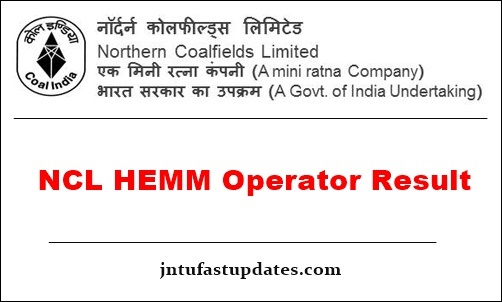 NCL HEMM Operator Result 2019: Northern Coalfields Limited (NCL) conducted HEMM Operator Exam on 20th January 2019. A large number of hopefuls have competed to get the NCL jobs 2019. The examination was conducted in many examination centers across India. Though the announced vacancies are 619, the level of competition is 50% more than the number of posts, as per reports. All the hopefuls competed for the NCL Dumper Operator, Jr. Over men, Mining Sirdar & Surveyor posts can check the answer keys of the conducted examination from the NCL official website, nclcil.in. The competitors can check the answer sheet and evaluate the score by tallying the answers with it. Aspirants competed for NCL written test and waiting for the result can check the NCL portal on a regular basis. Soon, the organization will announce the result date on its portal. For more information regarding the result date, cutoff marks, and merit list aspirants can go through the following article. Northern Coalfields Limited, Singrauli has recently rolled out a recruitment notification for 619 posts of Dumper operator, Dozer Operator, Shovel operator, Dragline Operator, Crane operator, Surface Miner/ Continuous Miner Operator, Grader Operator, and Payloader operator. NCL started receiving the application forms from 3rd September 2018 to 24th September 2018. A large number of candidates have applied for NCL jobs from across India. NCL selection process includes a written test, and interview round. Finally, the organization selects candidates with good merit. Selected candidates will be employed into the announced posts with the good pay scale. Hopefuls competed for duper operator, dozer operator, crane operator and various other posts in NCL and given the written test in the month of January 2019 can wait for few days to check the result. The NCL is tentative to release the result in the month of February 2019 [tentatively]. Usually, the result will be released within 3 to 4 weeks after the exam date. Hence the hopefuls must stay patient and keep checking the official website to download the result. Soon, the NCL official website, nclcil.in will give the information about the Duper operator result. On the homepage, you can find the update regarding the NCL HEMM Operator result 2019. Click on the link and enter the required details/login credentials. Click on the download result/submit button. The NCL result, score, merit list will be displayed on the screen. Soon, the NCL will announce the cutoff marks/qualifying marks for NCL Dumper Operator, Jr. Over men, Mining Sirdar, Surveyor posts, and other posts can check the qualifying marks for the conducted examination. Candidates have to score the minimum qualifying marks/cutoff marks in the exam to clear the written test round. Candidates need to score the mentioned cutoff marks/qualifying marks to clear the written test round. Finally, shortlisted candidates list will be released in the form of merit list. NCL Merit list with the names of written test cleared candidates will be revealed at the time of result. Candidates competed for the NCL written test can wait till the result declaration and check the merit list. Part B: Aptitude, Reasoning, GK, Skills etc – 30 Questions – 30 Marks. Candidates need to score at least 20% of marks from Part A and Part B. That is candidates need to score at least 14 marks from Part A and 6 marks from Part B to qualify the written test round. Note: There shall be no relaxation in sectional cut-off for SC/ST/OBC/Ex-Army Men or any category. Sir mera 54 marks aye h drill operator post k liye. Roll no-87307968, Gen se hu or mera no-58 hai ; 2nd list me Gen bale ko 63-58 tk seletect ky gy, jbki mera v 58 hai to mera selection kyu nhi hua sir .post -HEMM opreator.or HEMM opretor k waitting list kyu nhi khul rha hai. plz sir aap hi kuch bteye..